Lovely design and shape, quality was better than expected, thin, but does not create a lot of dust of fibres. 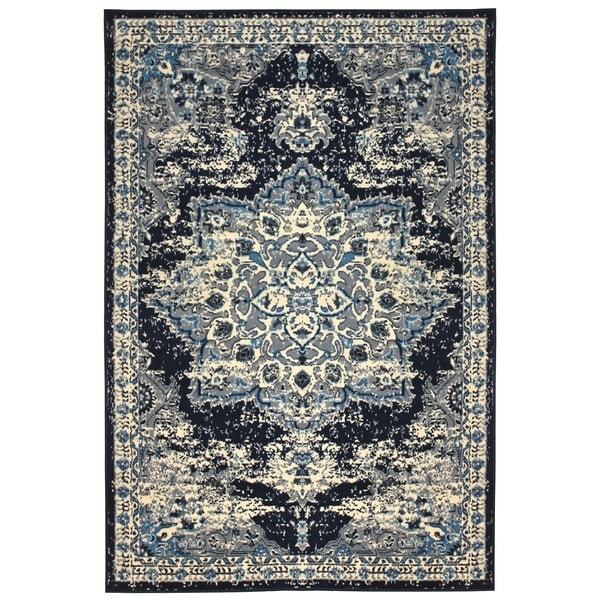 Aicha Navy & Teal Vintage Distressed Medallion Area Rug - 7'10" x 10'3"
Jasmin Collection Persian Medallion Navy / Ivory Area Rug - 7'10" x 9'10"
I purchased this rug for my living room. I was surprised how quickly it arrived and the packaging was great. When I opened it was impressed on how accurate the colors were to the website, the colors are perfect with my décor! The rug is a really nice quality for the price. I have purchased other rugs that were more expensive than this and were not even close to this quality. Overall you cannot go wrong with this rug. Thanks O! Perfect rug for my guest room! !